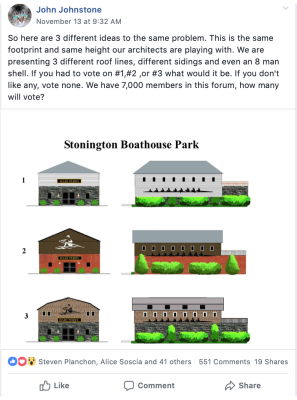 Mike O'Neill, Director of Rowing, clarifies information presented and answers questions raised in a ​​​​​ John Johnstone post on the Stonington Community Forum which summarized feedback on three boathouse designs that members were asked to vote on. MO: Thank you for taking time to speak with me today. Per our conversation I am concerned about the spread of misinformation about the park and boathouse project. I would like to respond to the topics that have been discussed on your post on the Stonington Community Forum. My goal is to make sure the public is well informed while providing feedback, just as you became when you shared your initial design with me. MO: Answer: The architect was chosen by an RFQ from the Friends of Stonington Crew (FOSC) and hired by them, not the town. Twenty-six firms applied for the job; AW Architecture was chosen, they currently rank #6 of the top 50 architects in the country. The design for the building balances three needs: the schematic requirements of the community rowing center, maximizing public park space, and the budget put forth by FOSC. The exterior façade was designed to mask a low-cost Butler style steel building and give the building an interesting form. A similar approach has gained public and architectural acclaim in Boston. That said, FOSC is actively getting feedback on the boathouse design and is confident that its award-winning architect is capable of creating a design that Stonington will be excited about. MO: We welcome the input / focus group that you are providing and appreciate the public response. This is a town park and community boathouse and ultimately for the benefit of townspeople. We will incorporate your feedback into our design process as we move forward. JJ: During this process I talked with an architect (Name skips my mind) and he said that many classes at architecture school were spent on SELLING YOUR DESIGN. It reminded me of “The curvature of the metal siding is like the sweep of an oar”. YAH RIGHT!!! MO: The architectural form and articulation of the siding were not represented well in the static renderings. The proposed metal on the outside of the building has a 50% open screen design to allow light to filter through it. The effect creates interesting shadows and lightens the building form making it appear smaller and more interesting than it is. Unfortunately, this is a very difficult thing to render in a static drawing. More importantly, FOSC and other stakeholders from the town, Seaport and public were actively involved in iterations of the design before this first version was presented. MO: Correct, the land for the park did not exist prior to the construction of the mill. It grew as the mill grew and was shaped by the natural wave a tidal action in the river. The land was created from dumping the coal slag from the boilers in the mill. JJ: The degree of contamination hasn’t been tested yet. The cost to decontaminate?? MO: Incorrect, over the past year the Town in conjunction with Kent+ Frost has done an extensive investigation of the park drilling holes and analyzing core samples. The samples confirm the prior work done before the town purchased the park. The remediation prescribed is to cover the coal ash with 2’ of clean fill. The coal slag has an arsenic content slightly higher than the EPA allowable level. The site also has some hydrocarbon contamination from its use as a gas station. These were all disclosed in the pre-purchase disclosures to the town and well understood. JJ: To meet flood zone requirements before building requires filling land area from 3’ now to 8’. MO: Incorrect, property is being filled to meet EPA requirements to cover contaminated soil, and in response to concerns for rising tides. The goal is to get the park above the 50-year rising water predictions. JJ: 2 historical buildings on this site: Talk about RED TAPE. Town could be required to keep them. The long blacksmith shop currently used to store SHS shells is useless as its’ length parallels rte 27. To be of any use it would have to be moved to the proposed boathouse site and be oriented so door opening faces water. If we are required to keep the blacksmith shop, a new boathouse design maybe meaningless. Where do we go from here? MO: The buildings on the site are in a historic zone “Rossie Velvet Mill Historic District” and on the register of national historic places along with the mill and many of the other houses in the vicinity. The buildings are in very poor condition. In order to be repurposed, they would need to be brought up to the current building code. This would require raising the building to current flood zone requirements with new foundations. They would also require new windows, doors, siding, roofs and HVAC systems. Environmental testing of the house found lead paint and asbestos. The cost of remediation would exceed new construction for buildings that don’t meet the future needs for the park or boathouse. For this reason, the park committee determined the best path forward would be to remove the structures. In order to do this, we will need permission from the “state office of historic preservation” SHIPA. Typically, these requests are made once a plan is in place for the future use of the property. We are just getting to this place in the project and the paperwork was recently submitted. JJ: Keep up to date on all news relative to this program. Attend the DECEMBER 1STmeeting 10am to 12:00 SHS. That is a Saturday, no excuse not to attend. Hope that Rob Simmons introduces 1 or 2 professionally designed alternative boathouses. Be sure you get the right to vote on them. MO: Kent+ Frost and the Friends of Stonington Crew will be presenting information about the development of the park and the boathouse. We will have a question and answer session and encourage the residents of Stonington to comment on this project. MO: There are more than 50 volunteers from our community working on this project. All of them have the best interest of the residents of Stonington first and foremost in mind as we develop this project. We welcome community involvement in the process and attendance at the monthly Mystic River Boathouse Park Implementation Committee meetings on the first Monday of every month at the police station. In addition, if you would like more information, please visit the boathouse page on the Stonington Community Rowing Center web site. We look forward to meeting you and answering any of your questions or concerns at the second public presentation on Saturday, December 1st at 10:00 am at the Stonington High School Commons.